Let’s talk about hair for a brief moment, shall we? Hey mother nature, how about laying off the humidity in the air for awhile, okay? 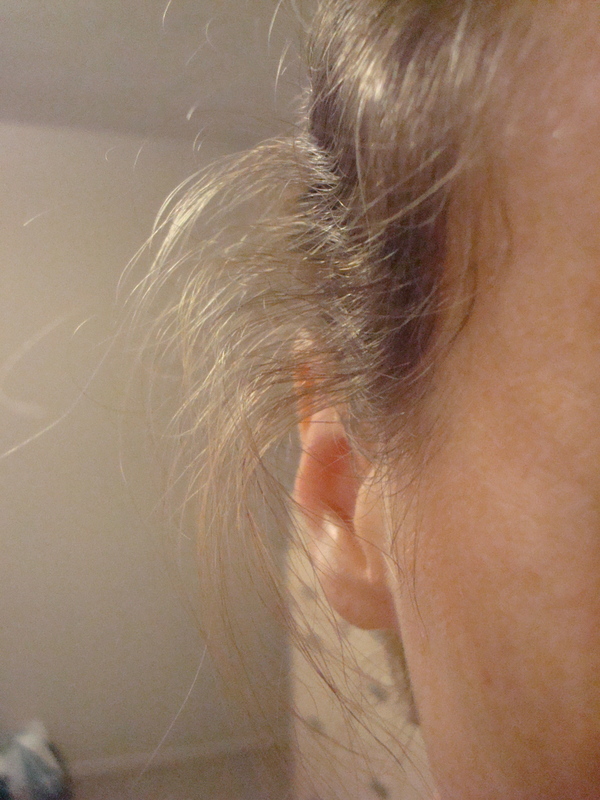 The dampness is killing my hair. I would really appreciate it! I look like a Hasidic Jewish man. I’m neither a Hasidic Jew nor a man. I bought a big bunch of it at the Farmers’ Market last weekend and I wanted a new way to cook with it. Gumbo immediately came to mind. I have never cooked Gumbo. Aside from the name itself, I really don’t know what entails a Gumbo. So I started my research on Wikipedia to figure what makes a Gumbo. I might have put a lot of garlic in the recipe. I love garlic though so I saw no problem with it. However, it was enough to wake up this morning and still smell it. “Hey….buffalo breath is that what they call you? Where was I? Oh yes, garlic breath. Be prepared. Enough said. Heat the oil in a medium pot on medium heat. Saute onions for 3 minutes until soft; add garlic. Saute another 2 minutes. Add Dried Spices Mix to onions and garlic. Stir around until fragrant (about 30 seconds). Add worcestershire sauce and tomato paste and stir around until it thickens a little. Pour in vegetable broth until a boil occurs. Simmer. Place the fresh thyme sprigs and bay leaves while simmering. 20 minutes. Add the okra and beans; cook another 5 minutes or until okra has softened. Serve over a bed of brown rice. Sprinkle with more seasoning. 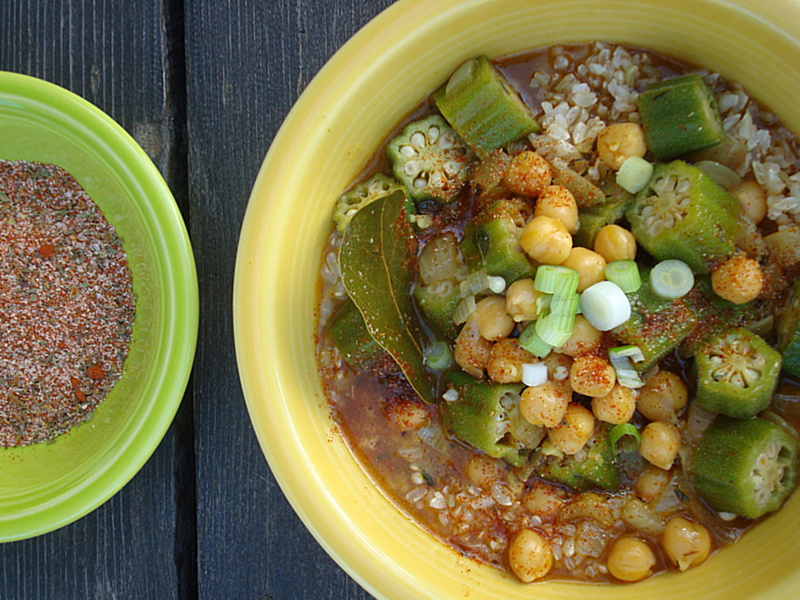 You can double the Dried Spice Mix in order to sprinkle it on top of the Gumbo before eating. It is so tasty! Just make sure you only use half of it when you are pouring it in the pot. Looks yummy…I’ve never tried Okra. What flavor would you say it resembles? I’m definately interested in trying it. Great question. What DOES it taste like??? Hmmmmm, it is a little slimy on the inside but that is what makes it delicious. Mild flavor. It has a nice little crunch to it. Tastes amazing battered and fried (what doesn’t????) I don’t know how to explain it other than trying it yourself. 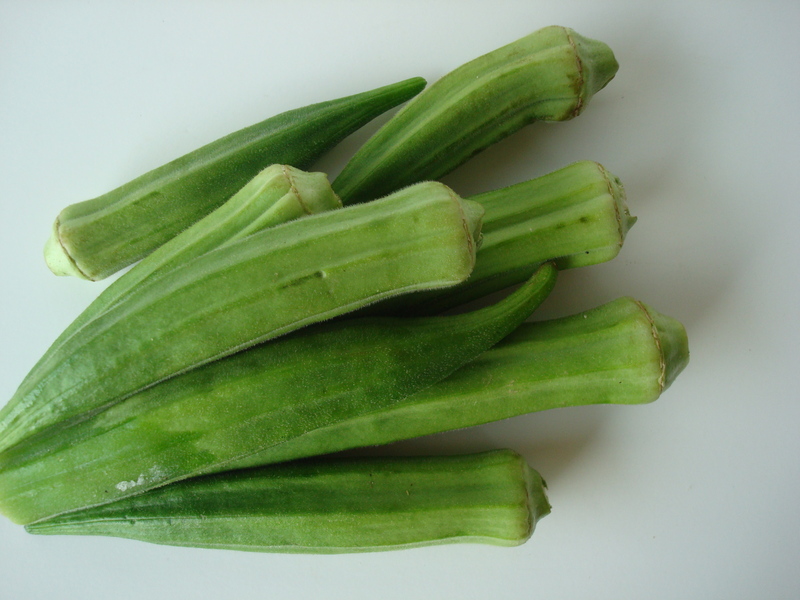 Okra is so unique and wonderful, it’s hard to compare 🙂 BUY SOME NOW!!! Hurry before it goes out of season this month! You wish you were a Hasidic man. . .